Children play at a makeshift camp outside of Moria Reception center at Moria Refugee Camp on Sept. 24, in Moria, on the island of Lesbos, Greece. With 4,600 refugees crammed into a detention center built for 650, the camp on this rugged island is more overcrowded than it has ever been. The simple fact is that people no longer fit. Instead of being given shelter, hundreds of men, women, and children are left to scrounge a place for themselves on the steep, scrabbly hillside. Europe has turned a blind eye, preferring instead to focus on treaties and fences designed to keep refugees out. But still people come. In Samos, a surge of more than 1,892 arrivals in October has pushed an already broken system to the edge. 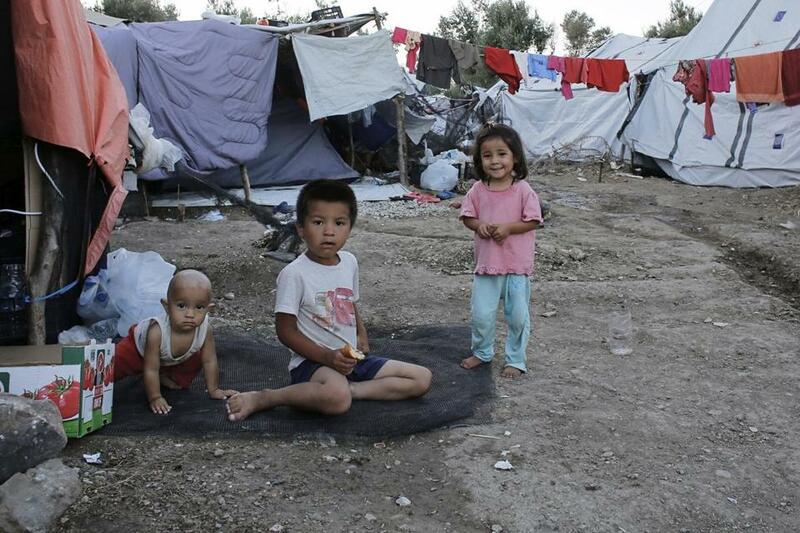 Only a mile from the coast of Turkey, Samos hosts the second largest refugee camp on the Greek islands. Yet, since I first volunteered here, in 2016, not a single brick-and-mortar shelter has been built. Instead, the camp festers. A labyrinthian, overburdened asylum process means that people are often stuck here for a year or more, waiting for their case to be heard. For the past month, I’ve been teaching English with the nongovernmental organization Samos Volunteers. My students come from all over the Middle East and Africa, reflecting the wide range of people seeking asylum in Europe. For the first time, Iraqis, Afghans, and Congolese outnumber Syrians. Despite dire living conditions, they manage to show up for class, usually looking more groomed than I do, with lipstick, a brightly colored hijab, enthusiastic, and eager to sound out “hat,” “cat,” “tent,” “camp.” They try out new sentences, such as “Where is the doctor?” and “How old are you?” Studying, having a notebook and pen to practice, having teachers and fellow students, can be a life saver. Alarmingly, some of the refugees who transferred to better accommodations in isolated places miss Samos because of the camp’s proximity to the town, the sea, and to classes. 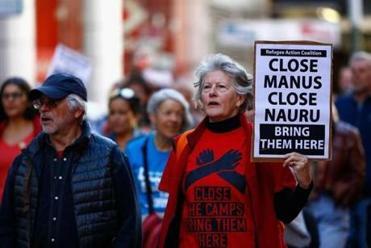 Australia subjects refugees to a cruel fate. US shouldn’t follow. As the Trump administration continues to bend toward authoritarianism, many concerned US citizens have looked to history for a blueprint. In class, we try to keep the mood upbeat — a sorely needed diversion — but harsh facts creep through. “How are you?” I was drilling, when a student ventured, “I am hungry.” The class nodded in sympathy. I went around asking: “Are you hungry?” Every student answered, “Yes, I am.” With so many new arrivals, the camp is running short of food. After waiting for hours, some of my students are not getting any. Food lines are excruciating, fractious, and sometimes violent. My students told me they wait for three hours for breakfast, and when it’s over, many line up for lunch. “Usually, I like to read a book at night, but we have no light,” said one student, apologizing for not finishing her homework. Lack of light seems a delicate understatement when, for many, there is no safe shelter, no running water, and no toilet. The United Nations High Commissioner for Refugees, the Greek government, and Greek NGOs are all supposed to be protecting vulnerable people. But the authorities admitted recently that 14 unaccompanied girls under the age of 18 were sleeping in half a portable housing container, in a space with only four beds. And they admitted that every toilet in the camp is broken. “It’s better to use nature,” my refugee co-teacher explained. And since it is not safe for women to defecate on the hillsides, “we use buckets . . . then put it in nature.” The hillside is littered with plastic bottles filled with urine and feces. One student in the advanced class wrote a piece entitled “Untold Facts About Single Young Men in Camp.” If a young man complains about being forced to share his already crowded tent, camp officials tell him he can move outdoors. Others talk about pests: mice, rats, and bedbugs that keep them awake. They show me infected rashes. Mothers worry about their children, many of whom exhibit psychological problems and can’t understand why they can’t go home. There are close to 1,000 children. A camp kindergarten takes 13. It only accepts children with vaccination records. No matter that the children are all living together on a trash heap. When Samos saw its first burst of winter recently, with a strong wind and rain, many of the cheap pop-up tents on the hillside washed away or were blown to shreds. Editing a small publication of student writing, I suggested we take names off any article about the camp. I didn’t want to risk getting anyone in trouble that might affect their asylum case. “But is this human rights?” one of my students protested. “What about freedom of speech?” These are the things my students have come to Europe to find, as well as safety and a better life. How should I answer her? Alice Greenway is a novelist currently working with Samos Volunteers.